Initial intensity reduction factor compared to a unpolarized beam: 7.5 at 2.5 meV; 6.1 at 3.7 meV; 5.5 at 5 meV. Time-averaged intensity reduction factor is about an order of magnitude. Please note that the flipping ratios and intensity reduction factors are just an example. Other options of higher flipping ratios and lower intensity reduction factors are possible. 3He polarizations decay with time. 3He polarizer and analyzer(s) are refreshed every 2-4 days depending on which cell(s) are used. Please note that optically pumping the cells takes ~2 days to maximize 3He polarizations. In addition, other instruments use the polarizers, hence the use of the polarized beam option must be requested and scheduled well in advance of an experiment. There are special requirements that must be considered when mounting samples for polarized beam measurements. No stainless steel of any kind should be used in or on the sample container, as that can cause uncontrolled depolarization of the neutrons. 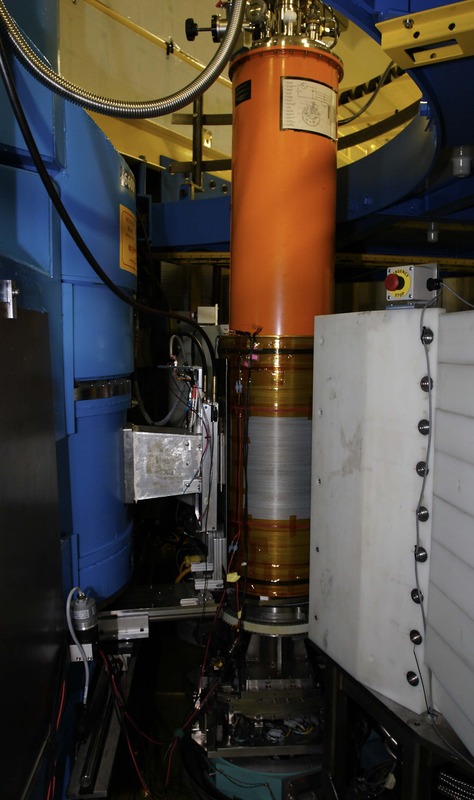 In addition, non-magnetic screws such as aluminum or brass should be used to mount the sample onto the copper block, for example, in a closed cycle refrigerator. For operation below 1.5 K, in a dilution or 3He refrigerator, additional care should be used to avoid superconducting materials. Cd inside the sample container has caused problems (TC = 0.52 K, HC = 2.8 mT). Pure aluminum has TC = 1.2 K, HC = 10 mT; 6061 Al alloy used for sample mounts and containers has a lower or no transition temperature, depending on the detailed composition and fabrication history, and can also cause problems in some circumstances.